I did this because there was a challenge on a cool electronics blog that I follow. The "boost converter" is pretty crappy because it does not produce a stedy voltage and it is only useful when the input voltage is between 2.3 V and 2.5 V. Below that, my AVR ATmega328P seems to stop running. Above that, the blue LED is on all the time (though it does get noticeably brighter when I run the boost). In this system, VCC is only boosted by about 0.7 V; it can go a little bit higher if I use more I/O lines, but it can't go much higher than that because of the blue LED. If I take the blue LED away, I see shorter but more extreme boosts on VCC. With one I/O line, I see a boost of 1.2 V. With two I/O lines, I see a boost of 1.7 V, and it seems like the sudden boost causes issues for the AVR and it usually resets after one or two boosts. With three I/O lines, I see a very sharp boost of 2.0 V for 2 us, and it consistently causes the AVR to reset. 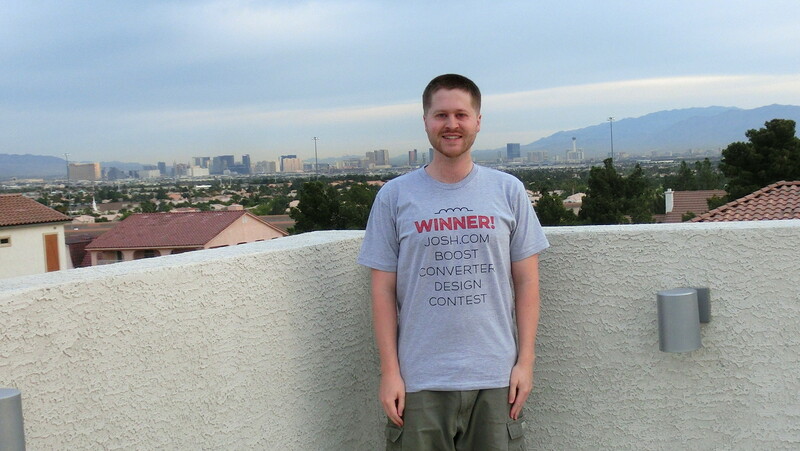 Update: I received a shirt from Josh for winning the contest. I like it!